Western Tanagers are gorgeous birds. They have brilliant contrasting coloring of intense red to sometimes orangish colored heads, Brilliant Yellow Bodies with black wings and tail. Their black wings have spots of yellow on the shoulder with more smaller spots of white or yellow about 1/2 way down the wing. These birds are like jewelry flying in the air. Hence I had to have a set of these made. Other birds have lots of yellow and may have black winds but they are just not as intense colors as a Western Tanager. These birds live in the pine trees that we have all over Colorado. When you see them you can't miss them. They love to eat fruits at your feeder. These are Fully shaped in 3 Dimension. 14KT Gold Filled Earring back. These Earrings can be made with pierced or clip earring backs. 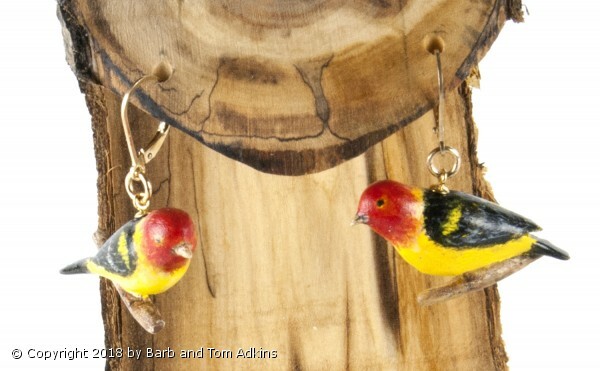 We will be adding a 3 Dimensional Flying Western Tanager Necklace in the near future.